While humanity has a close connection with the ocean, it can also be called a world that has much left to uncover. As much as the ocean is unknown, so too does it hold great potential, and it used not only as a food store, but also holds great energy resources. The Basic Act on Ocean Policy is the law governing Japan's ocean rights, and under this basic policy, there are articles concerning the development of marine resources and the promotion of their utilization, as well as the promotion of the development of our exclusive economic zone (EEZ). Our country is quite small in land area at 370,000 square kilometers, but our exclusive economic zone includes a vast marine area of 4.47 million square kilometers, sixth largest in the world, and the deposits of rare earth metals discovered on the ocean floor around Minamitori-shima Island are also located in these waters. If Japan can establish the technologies for utilizing this exceptional EEZ effectively and harvest these metals from the seawater, not only will it be a major solution to our resource problems, it will certainly have a significant positive impact on our energy security. The minerals from ores in the deep ocean floor are evenly dissolved in the seawater, and there are many types of metals. Including metals at low concentrations, it is said that there are 77 elements present, and many useful rare metals lay there. In a resource-poor nation such as ours, we are dependent on foreign nations for much of these resources, but if we look to the ocean, it presents the ability to meet those needs on our own. For example, useful rare metals such as uranium, titanium, and vanadium are present at extremely low concentrations of 2 to 3 mg per ton of seawater, but multiplied by the total volume of the world's oceans, it adds up to 4.4, 8.5, and 2.8 billion tons respectively. In the case of uranium, calculates to 1,000 times the estimated amount of actually recoverable land-based uranium reserves, and the surface layer of the ocean floor contains an additional 1,000 times as much, so even if uranium is harvested from the seawater, it is believed that leaching from the ocean floor would maintain the water concentration at a stable level. 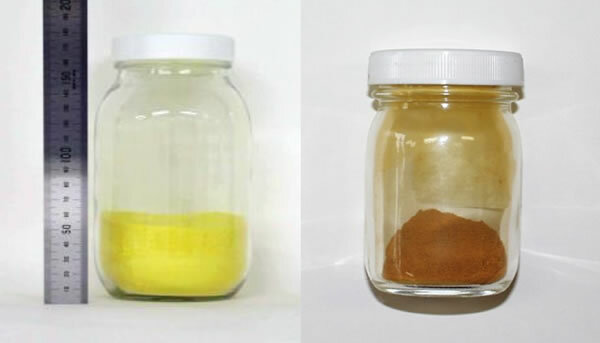 In order to extract useful metals such as uranium efficiently and inexpensively, the development of materials with high adsorption ability (adsorption materials) and a system suitable for ocean conditions was an important task. At the Quantum Beams Science Directorate of the Japan Atomic Energy Agency (formerly Takasaki Advanced Radiation Research Institute of the Japan Atomic Energy Research Institute), research on adsorption materials for extracting uranium from seawater has been underway since the 1980s, and a fibrous adsorption material possessing amidoxime groups with a strong affinity for uranium was developed through the use of radiation graft polymerization. 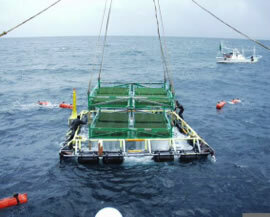 In 1999, marine tests were conducted off the coast of Mutsu-shi, Aomori Prefecture, using the floating mooring method (Photo 1), succeeding in collecting 1 kg of uranium (yellowcake conversion) as well as vanadium (Photo 2). 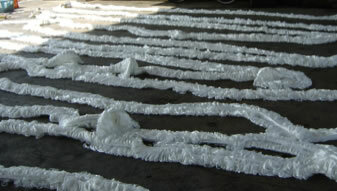 Therefore, in order to reduce the cost of the moored floating body, which accounted for the majority of collection costs, they devised and tested a braided adsorption material (Photo 3) that combined both the adsorption function and the mooring function in the adsorption material itself. Development of this new adsorption material commenced in 2000, and concurrent evaluation through marine tests began in the following year. Based on predictions that warmth would inhibit plankton and lessen the effects of microbes clogging the adsorption material, marine tests were transferred to the waters surrounding Okinawa, where it was expected that performance would be improved. As the seawater temperature of the ocean surrounding Okinawa is 30℃, 10℃ warmer than the waters off the shore of Mutsu, when they compared it with the adsorption ability of 2.0 g of uranium per 1 kg of adsorption material (with a weight conversion per kg of adsorption material, 2.0 g of uranium were collected) in Mutsu waters, they found that the performance was improved 1.5 times by the seawater temperature being 10℃ warmer. Additionally, the improvements to the structure of the adsorption material increased adsorption ability by three times compared with the adsorption performance of 0.5g of uranium per 1 kg of adsorption material in Mutsu waters. Taking into consideration that an increase in seawater temperature of 10℃ resulted in an increase in adsorption ability of 1.5 times, it can be said that the improvements in the structure of the adsorption material improved contact efficiency with the seawater, doubling performance. Furthermore, in small scale trials, they achieved performance of 3.0 g of uranium per 1 kg of adsorption material over 30 days of immersion, meaning that it was possible estimate adsorption performance over 60 days of at least 4.0 g of uranium per 1 kg of adsorption material. As well, in the anchoring method using the braided adsorption material, a float is incorporated into the core of the adsorption material and it is anchored to the ocean floor, so that the installed anchor does not present any obstacle until 40 m below the surface of the water, giving it the advantage of not hindering navigation by boats except when immersed for collection, as well as lacking susceptibility to the effects of waves, even the tidal bore, due to the characteristics of this anchoring method, making it very feasible in terms of safety as well. In a realistic consideration of this sort of extraction method, one challenge is coexistence with the fishing industry, that is to say, it is feared that immersion of the adsorption materials will change the living conditions of fish. As has been said, the higher the water temperature the greater the adsorption efficiency of the adsorption materials, so warm waters are desirable. Therefore, considering the main route of the warm Kuroshio Current, it is evident that there are suitable locations such as the waters between Iriomote-jima and Miyako-jima, the western waters between Okinawa and Amami Oshima, between Tanegashima and Yakushima, Hyuga-nada Sea, and Tosa Bay. Fishing that would be disrupted by the anchored adsorption materials include fixed net fishing and fish farms. Fishing methods that operate while in motion, such as longline fishing, trawl fishing, gill net fishing, and round haul net fishing are a challenge for the future, but it is thought that they could be able to adjust to the waters where the adsorption materials are anchored. As for communications and electrical cables on the ocean floor, as they are not laid or pulled up frequently, it is believed that they will be able to coexist with the adsorption material's anchors, which would be pulled up every two to three months. The next subject to consider is, while they are able to coexist more and more with fishing and marine recreation and leisure, the point of view of whether it will indeed be possible for them to guarantee energy resources. Currently conservation and management of marine resources is carried out through efforts such as catch limits on fishing and resource recovery projects, but as for the state of the marine resources in the oceans surrounding our country, especially bioresources such as fish and shellfish, of those resources that have been assessed, the conservation and management of half of them is as yet at a low standard. In addition to the effects of the marine environment, the development of coastal waters and the loss of seaweed beds and tidal flats, the spawning and rearing areas for many marine products, are offered as primary factors. There are also worries that the marine testing in order to recover rare metals from seawater will affect fish and shellfish. In the testing off the coast of Mutsu-shi, in addition to confirming that seaweed was affixed to the mooring line of the adsorption material and mollusks were living on the anchor, the adsorption material was pulled up, fish appeared from within the adsorption material, and I confirmed with my own eyes that it was truly a fish reef. 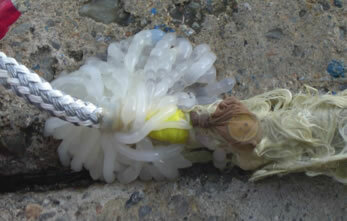 Furthermore, in the testing off the Okinawa coast, it was confirmed that squid eggs had been laid in the knots in the adsorption material (Photo 4), and that it could become a spawning area for fish and a rearing area for fry. As for the braided adsorption material, around the rope, which is offered as an element of a good fishing ground, a swirling current is produced, which makes it easier for fish to remain in place, and provides a structure that allows fish to protect themselves from predators, giving it high potential to be a design that is indeed well-suited to fish. Taking into consideration these data and test results, by expanding the scale of extraction and further improving the extraction technology, in the future, it should be possible to reduce the cost of harvesting to as low as few tens of thousands of yen per kilogram of uranium. When one considers the current circumstances in which Japan has almost no uranium self-sufficiency, harvesting uranium from the inexhaustible ocean can be said to be an effective step for energy in the use of nuclear power. Even in comparison with uranium ore, it is possible to make sufficiently profitable uranium fuel with uranium from seawater. There is no need to limit future options for Japan's energy policy. Coexisting with thermal power, hydro power, as well as shale gas, even from the point of view of the lead time for development, the harvesting of uranium from seawater is certainly not unrealistic, and it appears to be a method with great potential for implementation. Moreover, the extraction is not only for uranium. It can also be used for other rare metals. Technologies for rare metals dissolved in seawater aside from uranium have been established at the laboratory level. They can be used as though they were extremely practical underground resources which above all require no effort to find. Through extraction, it was possible to gather rare metals such as vanadium, nickel, and cobalt. Even if, for the sake of argument, the extraction areas for metal resources are fishing grounds and the use of the ocean is restricted, would it not be possible to develop them into a collaborative means of energy production with marine wind-power generators on the surface? In the wake of the Fukushima nuclear accident, we have been forced to cease nuclear power generation. However, as researchers, we have high expectations for new possibilities using our EEZ. 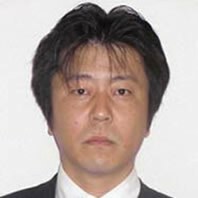 This may lead to new business chances for Japan, such as exporting uranium and other mineral resources.